Water defines life on Long Island. In addition to an ocean, we have three major estuaries: The Long Island Sound, which receives freshwater (via the Connecticut River) from as far away as Quebec; the Peconic Estuary in eastern Suffolk between the north and south forks; and a collection of south shore bays, including the Great South Bay in the west and Shinnecock Bay in the east, which together make up the South Shore Estuary Reserve. Long Island’s estuaries are beautiful as well as productive. 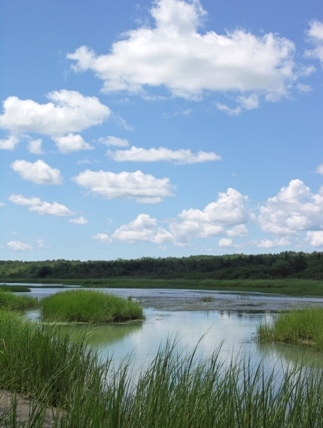 Estuaries, where fresh and salt water mix, are some of the most productive habitats on earth. Long Island’s estuaries have historically produced tons of shellfish annually, supported numerous species of finfish and birds, and provided jobs, recreation and flood protection for humans. Along southern Long Island, we have the Atlantic Ocean and our world-famous beaches. Not only is Long Island surrounded by salt water, but beneath our forests, fields, lawns, homes and streets, the ground is saturated with our only source of fresh drinking water. This water supply serves 2.8 million residents and thousands of businesses in Nassau and Suffolk Counties, providing them with more than 375 million gallons of water per day (according to the USGS Estimated Use of Water in the United States in 2000). There’s a vital connection between our drinking and surface waters. Because of Long Island’s geology, everything that flows from our toilets and drains, roadways, storm drains, and farms, has the potential to travel into our sole-source drinking water aquifers and from there into our surface waters. Long Island’s drinking water aquifers lie in layers under the land, absorbing pollutants along with water, and discharging into surface waters. As Long Island’s population has grown—from 600,000 in 1940 to 2.8 million today—the quantity of pollutants generated by our everyday living has dramatically increased. The most harmful of these for our natural systems is nitrogen. 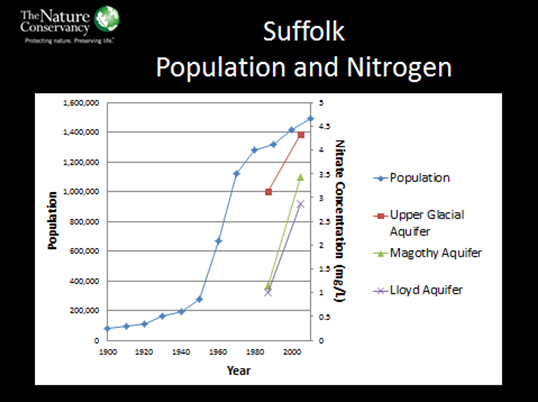 The relationship between population growth on Long Island and nitrate concentration in the underground aquifers. No homeowner with a fish tank would fill it with used toilet water, but that’s in essence what we are doing on a massive scale, discharging polluted wastewater into our surface waters, killing marine life and imperiling our drinking water. In its annual reports, the Suffolk County Water Authority has rated almost 70% of the County’s community supply wells as high, or very high, for susceptibility to nitrogen pollution, and all three of our estuaries are showing significant signs of stress with major declines in the health of natural systems and species. We can’t afford continued declines in the quality of our drinking and surface waters. With annual tourism revenue of over $5.2 billion, it is often said that on Long Island, the environment is the economy, but what visitor—or resident—wants to spend time in polluted waterways, dine at waterside restaurants that smell of rotting seaweed, or live in a seaside community where it is no longer safe to swim in the local water? Our maritime sector is already struggling with the loss of important habitats and fisheries. Perhaps the most extreme example is that until the 1970s, half of the clams eaten in the United States came from Great South Bay, but due to overfishing and harmful algae blooms caused by excess nitrogen, that number is less than 1% today. Fortunately, there are solutions. If we make necessary investments to improve and protect our waters we will protect our health and we will see economic and quality of life dividends as the health of our waterways improve. To remain a vibrant, attractive, and healthy place to live, work and visit, we need to address the underlying causes of our water woes. All sectors of Long Island need to work together so we can implement solutions here – for the benefit of all who live and work on Long Island and many generations to come. The fate of clams in Great South Bay need not become the narrative for all of Long Island’s waters. In addition to upgrading our aging wastewater infrastructure, nitrogen from sewage and fertilizers must be reduced, and other pollutants, such as pesticides, must be curbed. The Long Island Clean Water Partnership has an action plan to address these threats to our personal, environmental and economic health. Please join us. Tell elected officials you care about clean water.